The sun is rising over the Coast Mountains as Richard Hardy steps from the dock at the Comox Marina into a flat-bottomed boat. While other farmers in the Comox Valley may be heading out to milk cows or gather eggs, Hardy and his small crew are travelling across the water to a bay near Sandy Island. Here, in the crystal clear inter-tidal waters near Comox, is a 27.5-hectare oyster farm. It is one of seven similar operations totaling 64.3 hectares of ‘off-bottom and sub-tidal tenure’ managed by Pentlach Seafoods LP, a sustainable aquaculture corporation owned by the K’omoks First Nation. Hardy, whose First Nation’s name is ‘Namugwis’ and means ‘only one on the beach’ is a proud member of the K’omoks Band and President of Pentlach Seafoods. Committed to not only farming oysters but to growing the local economy, Hardy also serves as President on the Comox Valley Economic Development Society’s (CVEDS) Board of Directors. Hardy comes by his interest in aquaculture honestly. His people have been involved in shellfish harvest for millennium. After working more than a decade in the forestry industry, he was called to move from the forest to the sea, to follow the footsteps of his ancestors. They would be proud of what he and this Island-grown enterprise have managed to achieve in the last decade. In 2004, Hardy and about 30 other members of the K’omoks First Nation were trained in aquaculture techniques and collectively launched Pentlach Seafoods. During its first 10-years of operation, the company has generated more than $5.5 million in revenues from the sustainable planting and harvest of millions of farmed (not wild) clams and oysters. They have paid more than $3 million in wages to local people, the vast majority of whom are not K’omoks Band members. Their trademarked Komo Gway manila clams and oysters are now enjoyed in homes and restaurants locally, as well as at some of the top eateries in New York, Boston, Chicago, San Francisco, Vancouver, Calgary and Toronto. They are also distributed to various Sobey’s (Thrifty Foods) grocery stores in BC, Alberta, and Ontario. In January 2013, the K’omoks First Nation expanded their aquaculture investment with the purchase of a federally registered seafood processing plant called Aquatec Seafoods. They renamed it Salish Sea Foods LP, after the body of water formerly known as the Georgia Strait and now officially called the Salish Sea. In their first full year of operation, Salish Sea Foods increased their staff from 12 to 25, and almost tripled annual sales from $1.2 million to $3.2 million. If all goes according to plan, in the coming years the K’omoks Band ocean enterprises will expand to culturing geoducks and sea cucumbers, through a third company, Salish Sea Farms. They have applied for government approval and, once received, plan to invest $10 million in the project. Hardy says that sea cucumbers and geoducks are a highly sought after international trade item, and it is not unrealistic to anticipate annual revenues in excess of $50 million. Salish Sea Farms could also potentially generate an additional $100 million from indirect revenues that would benefit people locally, provincially and nationally. Hardy is quick to point out that the K’omoks First Nation aquaculture holdings are used in this story as an example, to give readers a general idea of the economic impact of the industry as a whole. The K’omoks Band activities represent only a small portion of the vibrant and ever-expanding multi-million dollar shellfish and fishing operations in the waters around the Comox Valley. It is an industry that is often overlooked and occasionally criticized by those who do not fully understand the long-term benefits of managing the sea through sustainable farming practices, as opposed to only harvesting (and potentially depleting) wild stocks. While the industry does have its antagonists, it also has many advocates. 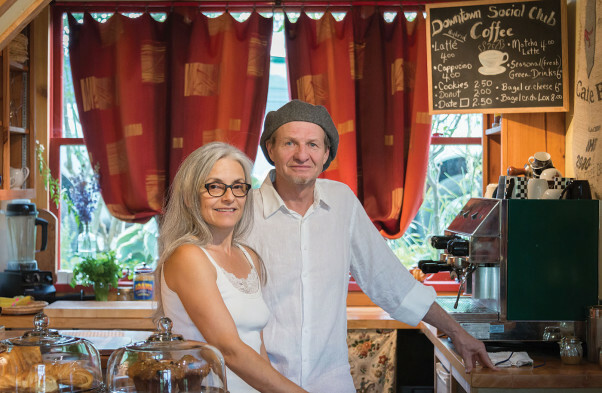 Chef Ronald St. Pierre and his wife, Patricia St. Pierre, owners of Locals Restaurant at the Old House Village Hotel in Courtenay, are two of its biggest champions. They steadfastly believe that the aquaculture industry is something to celebrate, and that public education is key to its future success. “It is imperative that people understand how the industry works and how important it is to the local economy and the ocean’s ecosystem,” says St. Pierre. At Locals, the St. Pierre’s pride in home grown seafood is reflected in the fact that about 50 per cent of their menu features food harvested from the Salish Sea. Quebec-born St. Pierre says he feels truly blessed to have such an abundance of fresh shellfish and fish to feature on his restaurant menu. He is always dreaming of new and exciting ways to prepare it for his patrons. “The Comox Valley truly is the land—and sea—of plenty and the people who live here need to appreciate that the aquaculture industry is not only growing but that it is sustainable,” explains St. Pierre. Roberta Stevenson, executive director of the BC Shellfish Growers Association, agrees. “A public education and marketing program was needed to improve the community’s perception of local seafood,” she says. “We needed to promote this century-old industry and tell the story of how shellfish farmers lease areas of the ocean to sustainably grow shellfish for world-wide distribution. “People need to understand the health benefits of eating seafood; that these products are completely natural, with no growth hormones or antibiotics; and that sustainable sea farming practices do not deplete local wild stocks. “Getting the word out about all the good things about this industry was a challenge because the shellfish farmers are always busy farming; they don’t have time to do a lot of marketing,” Stevenson adds. 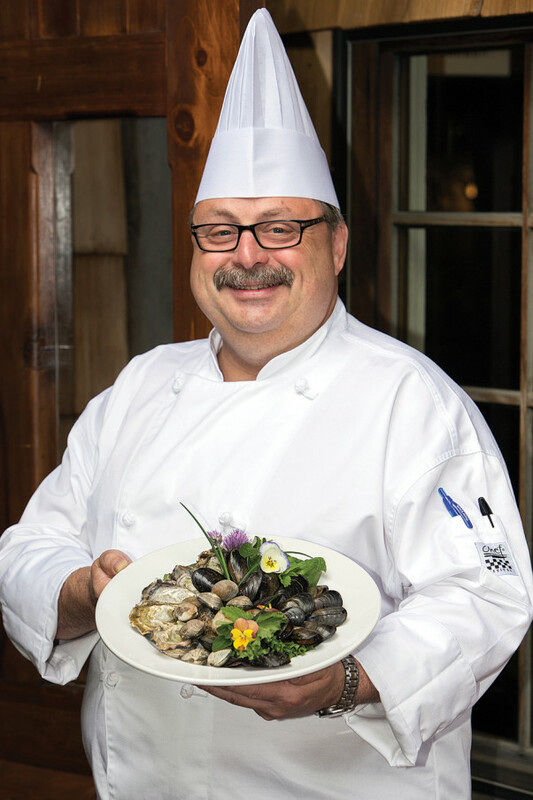 St. Pierre, chair of the Board for the North Vancouver Island Chefs’ Association, believes it is imperative that Island restaurants not only feature fresh local seafood but that they work collaboratively with industry to educate the public about the important role that the aquaculture industry plays in supporting the local economy. 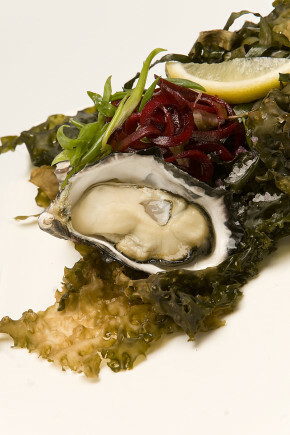 That is why he, and fellow members of the Chef’s Association, put their support behind the Shellfish Festival since the event’s inception in 2006. Celebrating its ninth year this June, the popular festival has grown from a two-day event to a 10-day extravaganza, making it the largest festival of its kind in British Columbia. With the BC Salmon Farmers Association and the Pacific Halibut Management Association coming on board, it has also grown from being a celebration of everything shellfish to now encompassing shellfish and seafood. That first year, Stevenson says she had to work hard to engage the community as both attendees and event sponsors were hard to find. Several chefs did agree to participate, and a couple of hundred people bought tickets to the inaugural Friday night shellfish feast. Fast forward to 2015, and the coveted 225 tickets to what is now an upscale gala evening of fine dining featuring local and celebrity chefs sells out in a matter of hours. By the seventh year, the event had grown larger than what could be managed by the small, largely volunteer-run, BC Shellfish Association. On behalf of her membership, Stevenson asked CVEDS to come onboard, to provide the financial and human resources required to take the event to the next level. While the Association is still involved and retains management of the signature Friday night gala, support from CVEDS has been instrumental to the Festival’s ongoing success. The 2015 BC Shellfish and Seafood Festival kicks off Friday, June 12 with ‘Fresh Fest’ at Comox Marina Park. Other events over the next 10 days vary from hands-on mornings learning how to forage for wild ocean edibles, to a 20,000 Leagues Under the Sea-themed dinner, a Mott’s Clamato ‘Best Caesar in Town’ bartending competition, to salmon farm, geoduck hatchery, and deep water and oyster beach tours. There is an evening of ‘Oyster Fun for Oyster Lovers’, and an extravaganza where lobsters from the East Coast will be flown in. On Friday, June 19, the 9th Annual Chefs Gala Dinner will feature the culinary masterpieces of several world-class chefs from across British Columbia. Hosted in the historic Filberg Heritage Lodge and Park, this decadent dining event begins with a raw oyster bar reception, sampling oysters of different regions of BC, shucked and served by the farmers who grew them. Guests will enjoy a sit-down six-course dinner, with each course created by a different BC Chef and expertly paired with a BC wine or craft beer. Unfortunately, the Gala Dinner is sold out, but there are still other new and exciting events to attend. There’s the ‘Casino Royal and Seafood Feast’ at the Old House Hotel & Spa, ‘I’d Like to Be Under The Sea Wine Maker’s Dinner’ at Blue Moon Winery, and the ‘Comox By the Sea Celebration’ at Filberg Heritage Lodge and Park. A real highlight for seafood and aquaculture suppliers, processors, growers and producers from the Pacific Northwest is the 1st Annual BC Seafood Expo and Workshop Series, June 13 and 14. The public is welcome to attend all or part of the Expo, to hear a number of keynote speakers address some of the issues and concerns that people may have. The Expo will also provide the aquaculture industry with an opportunity to network and share expertise, while doing business with buyers, industry innovators, and international trade representatives. In summary, Hardy says that the BC Seafood and Shellfish Festival in general, and the Expo in particular, provide an opportunity for people in the Comox Valley and beyond to come together to better understand how the aquaculture industry has grown to become a sustainable, profitable and international success story. Without a doubt, we have something to celebrate! Tucked close to the centre of downtown Courtenay, a quaint gravel walkway leads into a cozy courtyard full of wooden accents, flowers and rustic beauty. Tomatoes wind their way up a trellis and a basket of freshly picked pears can be seen over the fence that leads into the main garden. Here, in the back yard and downstairs of Kim Tymkow and Eirah Unger’s home, is The Downtown Social Club. The Club, which blends music, artistic performance, fabric art displays, a boutique and a coffee shop, is a little gem situated on the corner of Cumberland and Grieve, close to the Courtenay Fire Hall. Founded in 2007 by both Unger and Tymkow, the Club has seen more than 7,000 people come through its doors to attend the more than 200 events they have hosted in the past six years. It’s easy to see what has drawn people to this nook, where sultry jazz lingers in the air, artwork splashes the warm yellow walls, and a collection of musical instruments gathers to one side of the room. “There was always the intent from the beginning to create music,” says Unger, who decided that at the age of 50 he would return to playing music. “I like working, I like being productive, and mostly I like being creative,” he says. What began as a musical connection between Unger and Siobhan Walsh, who also happens to be Tymkow’s daughter, soon evolved to include Graham Shonwise, and the musical group Flat Nine formed in 2008. Flat Nine has recorded three CDs, and has a repertoire of more than 400 songs ranging from the early 1900s to current musicians. They make their way through songs from a variety of artists such as Steely Dan, Bob Dylan, Nat King Cole and Lady Gaga, and tap into a number of genres. Some of the musicians that join Flat Nine are local, and others travel from Vancouver, Victoria, Oregon, and elsewhere to perform. Their contact list is far reaching throughout the world to include people from Scotland, Australia, and many other places. Unger incorporates vocals, keyboard, grand piano, guitar, accordion, ukulele, mandolin, and harmonica into his musical resume. Walsh performs vocals, tenor/alto saxophone, keyboards, drums, and percussion, and Shonwise plays bass and alto/tenor saxophone. Michael Nye, Flat Nine’s newest member, brings drums and percussion to the stage. The couple, who met in Victoria in early 2000, decided to move to the Comox Valley in 2005. They began looking for a home to suit their needs that could also have a studio, and when they found the house at 574 Grieve Avenue, close to downtown and commercially zoned, they knew they had found what they were looking for. While original plans included a $12 million development hosting a private concert hall with nearly 200 seats, the economy crash that lead to lenders cracking down altered their vision. This past winter the space underwent some major renovations, including restructuring, redry-walling, and installing a complete fire separation between the studio, which is located in the downstairs of the house, and the main house itself. As well, a coffee bar was installed, with all of the cabinets being made using wood from the trees on the property. The Downtown Social Club is a unique venue with an intimate collection of people wanting to share their skills in a diverse and beautiful way. Unger, who grew up in ranch country, had his first job working in his mother’s fabric store when he was young. He stocked threads, draped fabric on women, and was making his own clothing by high school, where he had more music credits than anything else. He attended the University of Alberta to study Fine Arts in music. During this time he met and began touring with what was the second top concert band in Canada at that time. In 1980 he switched gears and moved to Victoria with his family, entering the business world in insurance. He did that for more than 30 years, and still does, when he isn’t playing music. “We’re not performers, as much as we’re servants of the song,” says Unger. “That is our attitude when the music starts—we get out of the way and let it flow through us. While Flat Nine has performed many events hosted in The Downtown Social Club including private parties, weddings, anniversaries, and birthdays, there are other performers hosted at the Club as well, and not all of them are musical acts. The Downtown Social Club recently booked a well known actress from Vancouver who is performing at the Fringe Festival in Victoria before heading up to Courtenay. The studio bustles with people during the day. The coffee shop is now open five days a week at 8:30 am for the day, and musical or other performance events that are open to the public are held at least three evenings a week. Sometimes there is music during the day. Private functions can also be booked and are hosted in the studio and on the garden patio. But her most evident passion is reflected on the walls of The Downtown Social Club and in the area reserved for her artwork—a small boutique folded into a corner of the studio. Most of her artwork is for sale. Two stunning draperies of silk hang from the wall—one a fusion of purple and golden yellow, with the shadow of lilies, and the other a soft blending of rainbow hues, and splashes of a bolder orange throughout. The art form is known as Shibori. “The Japanese have taken this art form way beyond what we think of as tie dye. Shibori is over 400 years old. Tie dye is a shallow term for everything you can really do with it,” Tymkow explains. Indeed, while the piece is reminiscent of tie dye, it is also incredibly unique. Tymkow uses a number of different processes when she is creating. She works with natural fibers and uses fiber reactive dyes so that the colors actually enter the fabric instead of remaining on the surface. She also directly paints onto cotton, silk, linen and wool. “I am working with my intuitive sense, with color,” she says. Another piece on the wall, this one framed as a painting, is mounted silk. “I’ve poured a liquid medium on it,” says Tymkow. “It will never be fabric again, it’s entered a new realm. This is surface design.” A number of techniques have been used to create this piece including stitching, batik, and the pouring medium. Tymkow has been working in the fabric industry for years. In Victoria she created custom clothing as well as working behind the scenes in opera and theatre creating costumes. She has worked with the Vancouver Opera, the Vancouver Playhouse, and the Arts Club Theatre. She also ventured into some film work but decided not to pursue that avenue. “She’s a master,” whispers her husband, Unger. Indeed, walking through the garden one can see frames where she had stretched her fabric, and bundles of tied fabric drying beside a vat of indigo, all evidence of her process. Upstairs, her home studio is filled with custom dresses and funky jackets, photos of theatre costumes and personally requested projects, and a multitude of fabrics in various states of creation. This seems more like a couture shop you’d find in some exotic city than an upstairs room in a home. Unger parades gowns and coats for a visitor to see and admire the stitching, the way the fabric shifts, and how it falls. Tymkow is a bit more reserved, both excitedly and modestly sharing her creations, but it is easy to see why Unger is so proud of his wife. This is the work of a master. “I don’t do it for anyone else,” she explains, “I do it for me.” She also takes on custom work. She points to a picture of the coat she made out of a sentimental family blanket for one woman, and of a grad suit she made for her daughter. At this point in their lives, Unger and Tymkow feel that they are stepping into the roles of mentors—as well as being artists, musicians, promoters, and founders of the Club. “We want to support art in different formats. He and I are interested in art and we’re hoping to find others who get us and what we’re trying to do,” says Tymkow. You can tell he’s both inspired by and inspiring to the people at The Downtown Social Club. Unger and Tymkow are hoping to reach out into the community of children as well as adults, to help educate and support local youth. With a woodworking shop out back full of raw wood, a plentiful garden with room to expand, the music studio which Unger is intending to accent with his baby grand piano, and the variety of artistic mediums available to be taught and on display, one can see what a variety of gifts the couple has to offer to the Comox Valley community, and to the children, youth, and young adults of our community as well. Unger hopes that by offering up The Downtown Social Club as an avenue for exploration and teaching he can develop a sense of creative and artistic expression in the next generations that counters the apathy he has observed, and to expand on what he views as an inadequate curriculum in schools today. “Let’s live life by life’s terms,” he says.